Large Brewers vs. Microbreweries: Are They Asking the Right “What If” Questions? If you know me, you know I’m not a fancy person at all. I drive a midsize car that’s a few model years old; I’m currently not wearing a single piece of clothing that cost more than $40; and I regularly eat leftovers for dinner. However, there’s one area where I won’t hesitate to buy the top-of-the-line product, and that is with beer. Despite being young and still getting on my feet, the last beer I grabbed out of my fridge was not a Budweiser, a Keystone Light, or even the Great Lakes region’s beloved Labatt. It was a Southern Tier 2x IPA, and it was delicious. I, and many others in my age range (the dreaded millennials that marketers love to come up with ridiculous strategies to target), have enabled craft breweries to double their market share to about 12% of the total beer market since 2011. 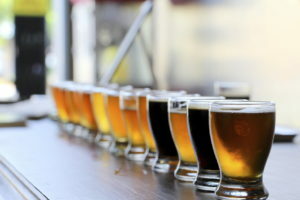 Following these trends and (rightly) fearing losing market share, macrobrewers have recently been purchasing microbreweries to try to cash in America’s new tastes in beer. AB InBev has purchased several growing microbreweries as part of its worldwide acquisition streak. Constellation Brands and Heineken, among others, also have gotten in on the action. Whether or not this is a good strategy long-term remains to be seen. Large brewers see the growth in craft beer and think, understandably, how can we get in on this market? A good question, as being in a rapidly growing market is usually desirable. But a better question would be can we grow in the market the same way true microbreweries do? Conducting a linchpin analysis would help identify some of the key questions that need to be answered in a complex situation like this. Linchpin analysis is a tool that allows us to look at several key assumptions built into our analysis, and determine how reliable they are or if they need to be evaluated further. The first step is to identify a list of assumptions. For this scenario, some assumptions would be that “premiumization,” or being willing to pay more for luxury goods, will last; that the economic situation will continue to allow younger people to spend more on alcohol; that macrobreweries won’t be able to develop their own premium brands to compete; and that it does not matter to most customers if a brewery is independent and local, as long as it has high-quality beer. Craft breweries will continue gaining market share, and the best way for large brewers to get in on this growth is to buy and expand craft brewers. Craft beers are a specialty product and higher in quality than a standard macrobrew. Most current headlines, with a few occasional detractions, show that the economy is slowly improving, which should enable younger people to continue to buy these small luxuries. Judgements generated in this step will usually look very similar to your overall hypothesis, but it may also reveal some underlying assumptions that change how the situation is viewed. Following this is the key step in linchpin analysis: taking one of the previously identified assumptions and reversing it. For this example, we’ll examine the assumption that it doesn’t matter to customers if the beer is independently and locally brewed or if it is a craft beer now owned by a multi-national brewing corporation. Despite being about equally good (or great, in my opinion and the opinion of many others) beers, I’d prefer Erie Brewing’s Railbender Ale from my hometown to Four Peaks’ (now owned by AB InBev) Kilt Lifter, simply to support a local business. So if most other people think like me, how does the situation look with this linchpin removed? It is a different result. Rather than being in a position to capitalize on the growing market of “beer snobs” spending lavishly on just a few worthwhile brews, a large brewer’s newly-acquired craft brand can quickly move to the position that Blue Moon (owned by Coors) has taken up among discerning beer drinkers, that of an imposter. This would then lead to more traditional quantitative research. How many of the brand’s customers even know who owns it? As we evaluate the linchpin further, it might show that a large majority of the brand’s customers are more casual and don’t know or don’t care about the ownership situation of the brewery, or it might show that the brand sells to a crowd of more educated drinkers who will abandon ship for the new microbrewery opening down the street. So what does a company take from this? Find your linchpins, and focus your analysis on those. Rather than looking for a good craft brewer to buy, a large brewer using linchpin analysis should first conduct research to see how much their target market cares that a beer is locally- and independently made. Any half-competent market researcher can handle the “how many” questions. If you’re not asking the right “what if” questions, “how many” might not even matter.